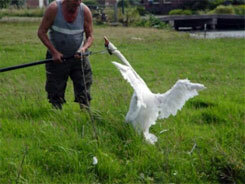 ﻿ Save and protect the Dutch swans! Thank you so much for signing!!! Pinioning (of all birds) will be banned in the Netherlands form january 2018. Just like cows, swans are an integral par of the flat Dutch landscape. Many of these beautiful, strong and trusty birds had a difficult life, particularly in the rural area of ‘The Green Heart’. Hundreds of swans in this area were owned by ‘swan herders’. The swans were pinioned, which means that part of the wing is amputated so that they will never be able to fly. They were then marked with tattoos on their beaks or ringed and released into the wild. In the winter they could not fly away to find a better climate. They became stranded on frozen ditches and ponds and had to walk in search of food and were often hit by cars when crossing roads. When the young swans were born they too were pinioned and ringed. Once they were old enough they were caught and sold. Many people found the way that this was done to be heavy handed and shocking. 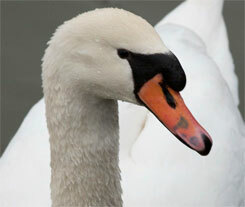 The tradition of swan herding dates back to the middle ages and has practically stopped throughout Europe. The Netherlands has been slow to legislate against this tradition. 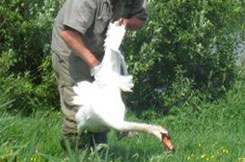 As the result of various actions of both organisations and people (especially a brave veterinarian who revealed many of the atrocities of the swan drifters by filming them and showing their deeds on national television) the government decided to ban swanherding from January 1st 2017. This swan is already tied at the feet. Now the swan herder is folding the wings in an unnatural way. 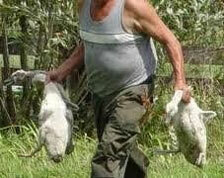 This way the swan is totally helpless and can be carried by the wings like a bag.